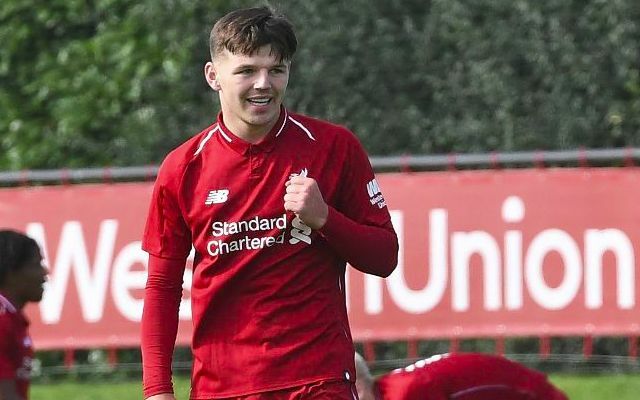 Bobby Duncan scored an injury-time winner as Liverpool’s U18s beat Portsmouth 3-2 in Tuesday night’s FA Youth Cup clash. The talented striker had a hand in all three of the Reds’ goals to continue his exceptional debut season with the club and end 2018 on a monumental high. Duncan opened the scoring on 15 minutes when he was able to breach multiple marks to run through on goal and slot clinically beyond goalkeeper Leon Pitman. He turned creator just after the half hour mark to dissect the Pompey defence with a superb pass to Abdi Sharif, who converted his chance to double Liverpool’s lead. A second half fightback saw the visitors pull a goal back from the penalty spot through Bradley Lethbridge after Duncan had been penalised for handball. Portsmouth soon drew level as the lively Lethbridge crossed for Joe Hancott to finish into an open net for 2-2. Liverpool were not to be denied, however, with Paul Glatzel triggering a well-worked corner to set up Duncan for a simple finish in the 92nd minute. Duncan’s winner marked his 19th goal across all competitions so far this season following his summer move from Manchester City. The Englishman has asserted himself as a prominent figure in Barry Lewtas’ team and has already been called upon by the club’s U23s. Such has been his immediate impression that the teenager has reportedly attracted interest from the likes of Bayern Munich and RB Leipzig in their bid to uncover the next Jadon Sancho-esque success story. It seems a fair assessment to suggest Liverpool won’t be parting ways with him any time soon. A win for the U18s means they finish the year on a four-game winning streak.